Revisit Cassini’s legacy with our study guides on two of its discoveries. 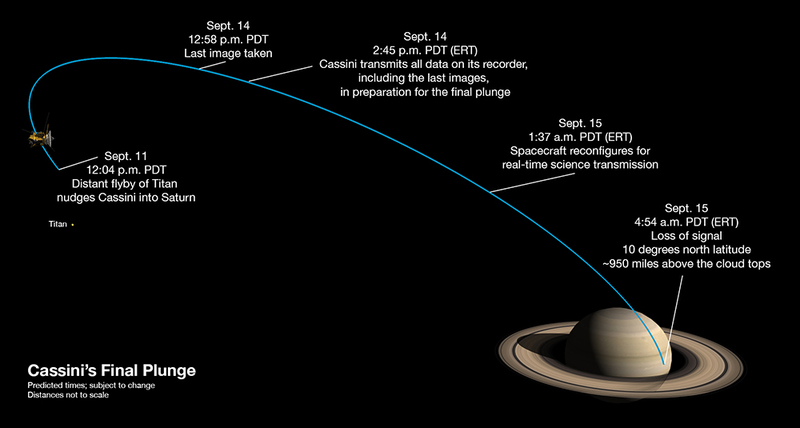 The world is watching as NASA prepares to crash its Cassini spacecraft into the gas giant Saturn. What is Cassini? Cassini is a sophisticated robotic spacecraft orbiting Saturn and studying the Saturnian system in detail. Cassini is a joint endeavor of NASA, the European Space Agency (ESA) and Agenzia Spaziale Italiana (ASI), the Italian space agency. Cassini originally carried a probe called Huygens, which parachuted to the surface of Saturn’s largest moon, Titan, in January 2005. 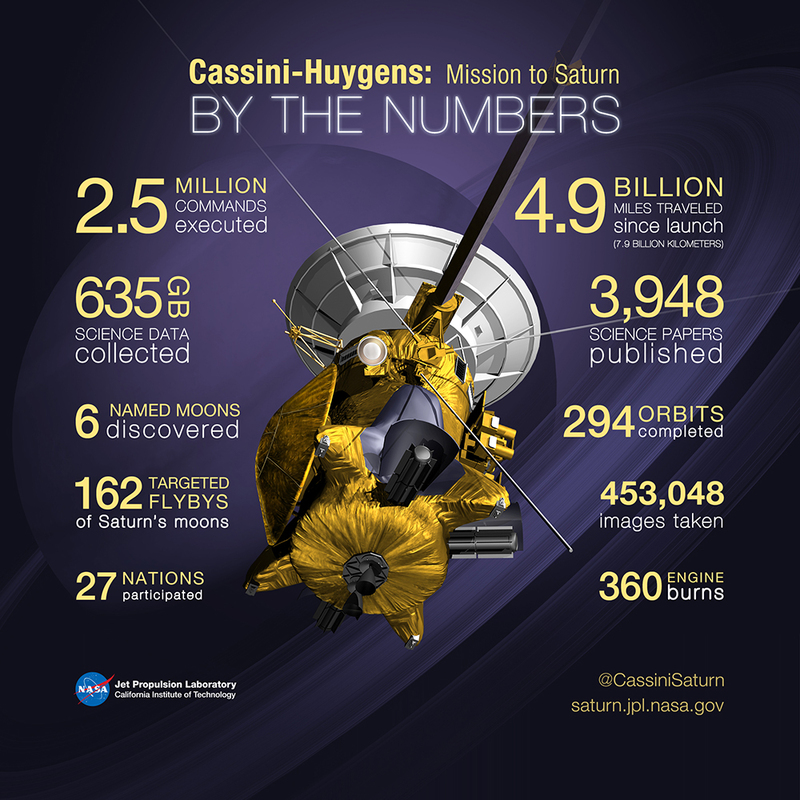 Cassini has 12 science instruments grouped to study three aspects of the Saturnian system. Optical Remote Sensing: The Composite Infrared Spectrometer (CIRS), Imaging Science Subsystem (ISS), Ultraviolet Imaging Spectrograph (UVIS) and Visible and Infrared Mapping Spectrometer (VIMS) study the Saturnian system using the electromagnetic spectrum. Fields, Particles, and Waves: The Cassini Plasma Spectrometer (CAPS), Cosmic Dust Analyzer (CDA), Ion and Neutral Mass Spectrometer (INMS), Magnetometer (MAG), Magnetospheric Imaging Instrument (MIMI), and Radio and Plasma Wave Science (RPWS) study the dust, plasma, and magnetic fields around Saturn. Microwave Remote Sensing: Radar and the Radio Science Subsystem (RSS) map atmospheres, determine the mass of moons, collect data on ring particle size, and unveil the surface of Titan. Make a model of Cassini with a 3D printer, paper-and-scissors … or dessert! Cassini was launched in 1997. What has it helped scientists achieve, discover, and learn in its 20-year mission? Huygens transmitted data for about 90 minutes after landing on Titan, and remains the most distant landing of any human-made object. Learn more about Huygens’ discoveries here. Cassini discovered active, icy plumes spraying from the moon Enceladus. Learn more about Enceladus’ extraterrestrial ocean here. Cassini-Huygens helped scientists interpret Saturn’s famous ring system as a (relatively) tiny laboratory of how planets and rings formed in the early solar system. Learn more about that process here. Cassini-Huygens found that Titan is an active celestial body, with rain, rivers, lakes and seas … made of methane. Learn more about Titan here. Cassini imaging helped scientists track the life and death of a massive, planet-spinning storm. Learn how that storm “choked on its own tail” here. Cassini’s “Fields, Particles, and Waves” instruments help reveal fluctuations in its radio waves. Learn more about Saturn’s radio waves and the solar wind here. Cassini revealed vertical “splash” structures in Saturn’s rings up to 3 kilometers (2 miles) high. Learn more about those weird structures here. Cassini-Huygens helped scientists identify both Titan and Enceladus as having “prebiotic” chemistry—a natural environment that has the chemical ingredients for life. Learn more about the search for microbial life on Enceladus and Europa here. Cassini helped solve the puzzle of the “two-faced” surface of the moon Iapetus—the dark spots indicate where dark dust in Iapetus’ path has crashed onto the planet. 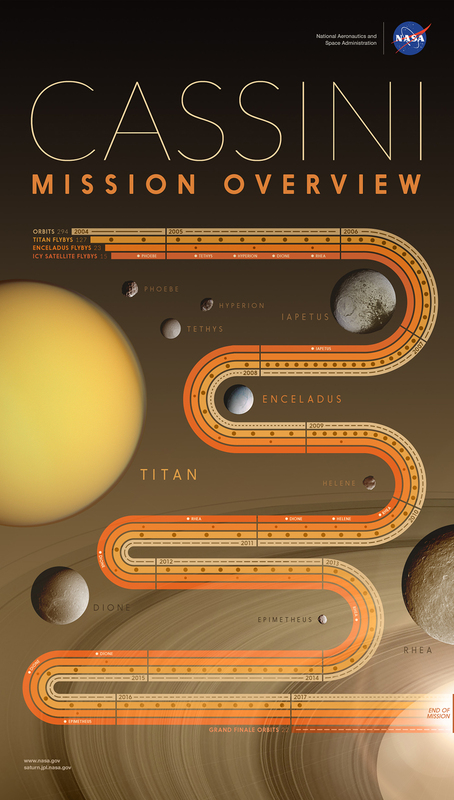 Learn more about Iapetus here. Cassini discovered and took a good look at giant hurricanes at both of Saturn’s poles. Learn more about Saturn’s strange storm here. Why is NASA crashing Cassini? We don’t want to pollute the solar system! Could terrestrial microbes really pollute moons in the outer solar system? OK, we have to save the Saturnian system from earthly pollution. What is the “Grand Finale”? It’s awesome, is what it is. We love objects discovering the escape velocity of gas giants. Why a plunge instead of another method of disposal, such as sending Cassini somewhere else in the solar system, attempting a landing on one of the moons, or crashing into the rings? If Cassini’s death plunge takes it into Saturn, won’t it pollute the Saturnian atmosphere the way it might pollute the moons? This is probably our favorite example of what happens when an object meets a gas giant. What are the final data scientists are hoping to glean from Cassini as it makes its fiery plunge? One of our favorite (of many!) 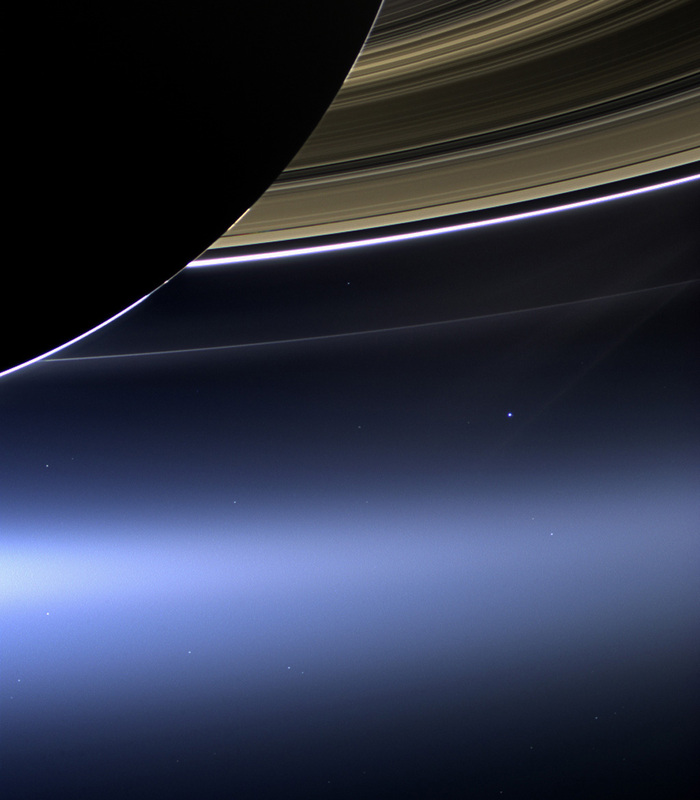 images from Cassini is that bright blue dot in this gorgeous image—that dot is you, me, and everyone else on the planet, from a distance of 1.44 billion kilometers (898 million miles).